One of the first and most popular SaaS providers, Salesforce has led the way on hosted business solutions. Their motto (and phone number) is “No Software,” referring to the fact that the entire service is based in the cloud, rather than on on-premise hardware or downloaded software. Salesforce.com has a customer base over 100,000 strong, and sales of over $4 billion. Founded in 1999 by Marc Benioff, Parker Harris, Dave Moellenhoff, and Frank Dominguez, Salesforce.com is headquartered in San Francisco, CA, USA. In the fifteen years since it started, Salesforce has grown to include many smaller companies that have been incorporated into Salesforce’s platfom. Salesforce has expanded their platform to include web directories, customer support platforms, and data tracking tools. Sales Cloud Enterprise, $125/user/mo. – Designed for companies of all sizes, Sales Cloud allows subscribers to keep track of their customers’ information, share it with other members of their team, and get new leads. Billed at $125/user/mo, it is paid annually and therefore requires a one-year contract. While there is no set time for how long it takes to start using Sales Cloud, it typically takes 1-3 days for small businesses to deploy Sales Cloud; larger businesses require more preparation and customization. Sales Cloud Group, $25/user/mo: Account & contact management; Opportunity tracking; Lead scoring, routing & assignment; Task & event tracking; Customizable reports & standard dashboards; Mobile access, customization, & administration; “Chatter” company social network; Outlook Side Panel & sync; Case management. Sales Cloud Professional, $65/user/mo: All above features; Campaigns; Customizable dashboards; Collaborative forecasting; Products, quotes, & orders; Mass email; Role permissions. Sales Cloud Enterprise, $125/user/mo: All above features; Workflow & approval automation; Report history tracking; Profiles and page layouts; Custom app development; Integration via web service API; Salesforce Identity; Salesforce Private AppExchange. Sales Cloud Unlimited, $250/user/mo: All above features; Unlimited customizations; Unlimited custom apps; Multiple sandboxes; Additional data storage; 24×7 toll-free support; Access to 100+ admin services; Unlimited online training. Desk.com Standard, $30/user/mo: Case management; Multi-channel support; Productivity tools; Self-service customer portal; Desk.com mobile app; Reporting & analytics; Knowledge base; 3rd-party integration. Service Cloud Professional, $65/user/mo: Case management; Computer Telephony Integration (CTI); Web and email capture; Mobile access; Reports & analytics; Auto-suggested solutions; Case auto-assignment & escalation; Customizable dashboards; Content library; Email integration; Sales features such as opportunities & customizable forecasting. Service Cloud Enterprise, $135/user/mo: All above features; Service Cloud Console; Service contracts and entitlements; Knowledge base (available for a fee); Web chat (available for a fee); Salesforce Communities for Service (available for a fee); Social customer service (downloadable application); Workflow & approvals; Visual workflow; Call scripting; Case team collaboration; Integration via Web Services API; Developer sandbox; Offline access; Enterprise analytics; Salesforce Identity. Service Cloud Unlimited, $260/user/mo: All above features; Unlimited customizations; Unlimited custom apps; Multiple sandboxes; 24×7 toll-free support; Unlimited access to 100+ admin services; Unlimited online training; Mobile customization and administration; Additional data storage. Service Cloud and Sales Cloud Bundle Performance, $300/user/mo: Integrated knowledge base; Live web chat; Goals, coaching, and rewards for teams; Single console view for Inside Sales; Access to new contacts and accounts; Auto data cleansing; Additional sandboxes; Additional storage. ExactTarget Marketing Cloud Basic: Campaign management; Email marketing; SMS & MMS mobile solutions; Mobile push messaging; Web personalization; Social media publishing; Transactional email; Conversion tracking; Tracking & reporting; 10 user log-ins (more available for purchase); Up to 300,000 Super Messages per year (more available for purchase). ExactTarget Marketing Cloud Professional: All above features; Journey management; Marketing automation; Social media listening; Social media feed publishing; 25 user log-ins (more available for purchase) Up to 1 million Super Messages per year (more available for purchase). ExactTarget Marketing Cloud Corporate: All above features; Predictive Intelligence; Distributed marketing; Mobile location-based messaging; Discover reporting tool; 50 user log-ins (more available for purchase); Up to 500,000 contacts; Up to 5 million Super Messages per year (more available for purchase). 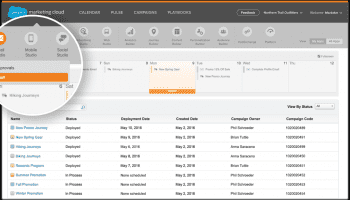 ExactTarget Marketing Cloud Enterprise: All above features; Audience Builder data management tool; 100 user log-ins (more available for purchase); Up to 2.5 million contacts; Up to 20 million Super Messages per year (more available for purchase). 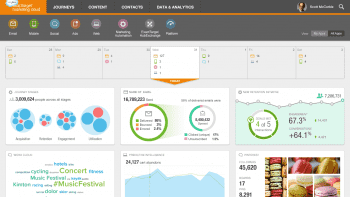 ExactTarget Marketing Cloud Performance: All above features; Most advanced email, mobile, social, & web editions; 250 user log-ins (more available for purchase); Up to 10 million contacts; Up to 50 million Super Messages per year (more available for purchase). Community Cloud Customer: Social collaboration for customers and employees; Mobile access; Custom branding; Q & A for self-service; Access to support cases, accounts, and contacts; Knowledge base articles; Idea submission and endorsement; 10 custom objects; Salesforce Identity. Community Cloud Partner: Role-based sharing for controlled data access; Lead and opportunity management; Delegated administration capabilities; Run and Export Reports; Dashboard viewing; Social collaboration for customers and employees; Mobile access; Custom branding; Q & A for self-service; Access to support cases, accounts, and contacts; Knowledge base articles; Idea submission and endorsement; 10 custom objects; Salesforce Identity. Reports; Answers and Ideas; Workflow; Tasks and Events; Advanced sharing. Force.com Enterprise App, $25/user/mo: Access to 10 custom objects per user; A customizable mobile app; Mobile Services & SDK; Workflow and approvals; Sharing and user access; Salesforce Identity; Chatter; Point & click development; Real-time APIs; Reporting and dashboards; Private AppExchange; Cloud database. Force.com App Bundle, $80/user/mo: Build up to 10 apps with access to 200 custom objects per user; all above features; A total of 25 tabs per user; 1000 APIs calls /user/day. Force.com Unlimited Apps, $150/user/mo: All above features; Access to 2000 custom objects per user; Unlimited apps per user; Unlimited tabs per user; 5000 APIs calls /user/day. Force.com Connected Customer App Package (customized quote available): Salesforce1 Heroku; Connect; Heroku XL Dynos; Postgres Database; Essentials add-ons; Force.com customer logins. Data.com Corporate Clean, $25/user/mo: Manual update and enrichment of existing leads, contacts, and accounts; List-based clean of leads, contacts, and accounts; Data.com record comparison screen; Reporting; Data quality dashboards; Sync and match jobs; Schedule Clean jobs; Notifications in Chatter feed; Social handles for Twitter, Facebook, and LinkedIn. Data.com Premium Clean, $35/user/mo: All above features; Global ultimate business name; Corporate family linkages; D&B company object; Up to 6 total SIC/NAICS industry classification codes; Account tradestyle; Account delinquency risk; Account latitude and longitude; More premium data fields. Data.com Corporate Prospector, $125/user/mo: Access to 40 million new contacts and 200 million new accounts for more cross-selling opportunities; Search for a company or contact; Search by industry (SIC/NAICS), location, or revenue; View contacts’ phone and email; View company description and basic firmographics; Manual clean and update of leads, contacts, and accounts; Data.com record comparison screen; Import Global Dun & Bradstreet (D&B) company data and contact records into Salesforce (300/month/user); D-U-N-S® number; List export to .csv; Reporting; Additional records $0.50/contact. Data.com Premium Prospector, $165/user/mo: All above features; Global ultimate business name; Corporate family linkages; D&B company object; Up to 6 total SIC/NAICS industry classification codes; Account tradestyle; Account delinquency risk Account latitude and longitude; More premium data fields. 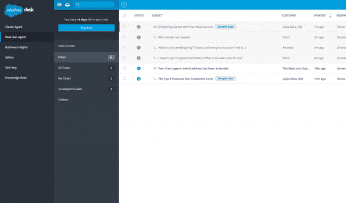 Salesforce Chatter, Free with purchase of 1 CRM license: Up to 5,000 employees; Chatter Messenger; Profiles; Status updates; Activity feeds; Group; File sharing; Chatter Desktop; Chatter Mobile; Trust and Security. Salesforce Chatter Plus, $15/user/app/mo: Accounts (read-only); Contacts (read-only); 10 custom objects; 1 custom app; Dashboards; Reports; Answers and ideas; Integration with 900+ AppExchange apps; Workflow; Calendar and events; Tasks and activities; Advanced sharing; Salesforce Private AppExchange; Salesforce Identity. Work.com Motivate, $10/user/mo: Real-time recognition & rewards; Chatter company social network; Rich social collaboration; Customizable recognition badges; API access to all Work.com data; Single Sign on with salesforce.com; Customizable reports & dashboards; Mobile access. Work.com Align, $15/user/mo: All above features: Align Company, Team, & Personal Goals; Coaching integrated to sales process; Compatible with OKR, SMART, etc; Goals linked to salesforce.com data; 1:1 coaching, feedback, & mentoring. Standard Success: Online assistance; 2-business day response time; online guides and FAQ. Premier Success: 1-hour initial response for critical issues; priority access; troubleshooting and code reviews; over 100 online training courses available. Premier + Success: All above features; over 100 administration services for ongoing application maintenance; administrator can work with Salesforce.com’s team directly to update Salesforce configuration. Mission Critical Success: All above features; 15-minute response time to Severity 1 issues; 1-hour response time to Severity 2 issues; 4-hour response time to Severity 3 issues; 8-hour response time to Severity 4 issues; 24×7 availability; 8am-7pm M-F core support hours; performance monitoring; personalized support; preventative maintenance. High-profile clients include Virgin America, Philips, Coca-Cola, Toyota, Dunkin Donuts, Facebook, GE. Salesforce was a pioneer in SaaS, and continues to be a leader. They are constantly updating their platform, either from internal innovation, through acquisition, or through partnerships. Salesforce has a posted uptime of 99.9%, but they do not offer an SLA. Their support is good, but if you want fast service, you have to be prepared to pay for it. Salesforce may be the biggest name, but that does come with a few drawbacks. The biggest downside may be price, as Salesforce can command high prices. Also of note, you require a one-year commitment. Salesforce is also a little more bland, some even say dated, compared to newer CRM providers. What Do You Think of Salesforce?